12.5X Macro lens to take sharp pictures as close as 50mm from the subject (perfect for jewelry, flowers, coins, insects, etc.). Features: Modern design universal clip can attach any 37MM Thread Digital DSLR Pro Lens 0.45X wide angle lens for a high definition wide angle image without distortion for the perfect landscape or group photos. Warranty: Every Socialite Product includes a 30 days money-back & 12-month worry-free warranty! The Socialite 2 in 1 clip-on detachable HD lens for mobile smartphones, iPads, tablets and laptop cameras. The macro lens can take pictures of tiny objects clearly in focus while the wide angle lens is perfect for taking pictures of wide ranges, such group of people, buildings and landscapes. Universal detachable clamp design works on nearly all types of mobile phones that the distance between its camera lens and its top is less than 1 inch. Perfect for most mobile cell phones, easy and convenient to operate while small and portable. Fits iPhone, HTC, Samsung, smart phone, iPad, Tablet PC Macbook Air or any phone lens you can imagine. If you have any questions about this product by Socialite, contact us by completing and submitting the form below. If you are looking for a specif part number, please include it with your message. 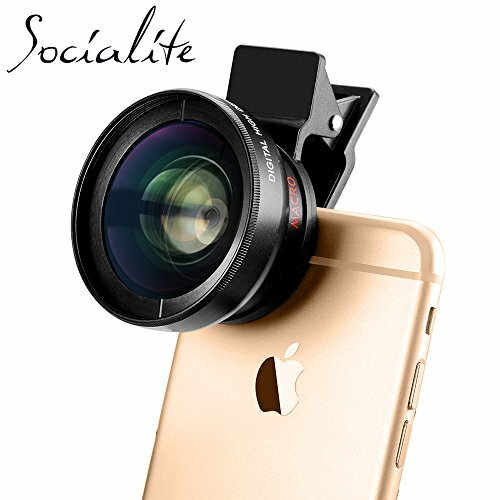 Camera Lens Kit, Stoon 180° Fisheye Lens & 15X Macro Lens & 0.65X Super Wide Angle Lens Clip-on Cell Phone Lens for iPhone X, 8, 8 Plus, 7, 7 Plus, 6, 6 Plus, Samsung Note 8, S9, S9 Plus, etc.